Observers often comment on the special atmosphere of calmness and purposeful work that is evident in the classroom and on how happy and contented the children are. The classroom is designed specifically to suit the needs and interests of the children. Children from three to six years share the same classroom and have the same educators during their entire time at the school. The mixed age group allows the children to learn from each other, and because of each other. The younger children are inspired to further activities through observing the older ones, and the older children reinforce their own knowledge by sharing it with the younger ones. Children become functioning members of their own community. They are treated with respect and dignity and learn to treat others in the same way. The role of the teacher is to observe, guide and facilitate rather than teaching in the conventional sense. Children are introduced to new materials at an appropriate stage for their own individual development. They are free to choose their work from any of the materials which they have been shown. They may work for as long as the exercise holds their interest, free from interruption, competition or correction. Many materials are self-correcting, allowing children to solve problems by themselves. Children often choose to repeat exercises over and over until they are quite satisfied that they have mastered them. Children may work on their own or with friends and there are also group activities such as story-telling, music and movement, and periods of unstructured play in the garden. 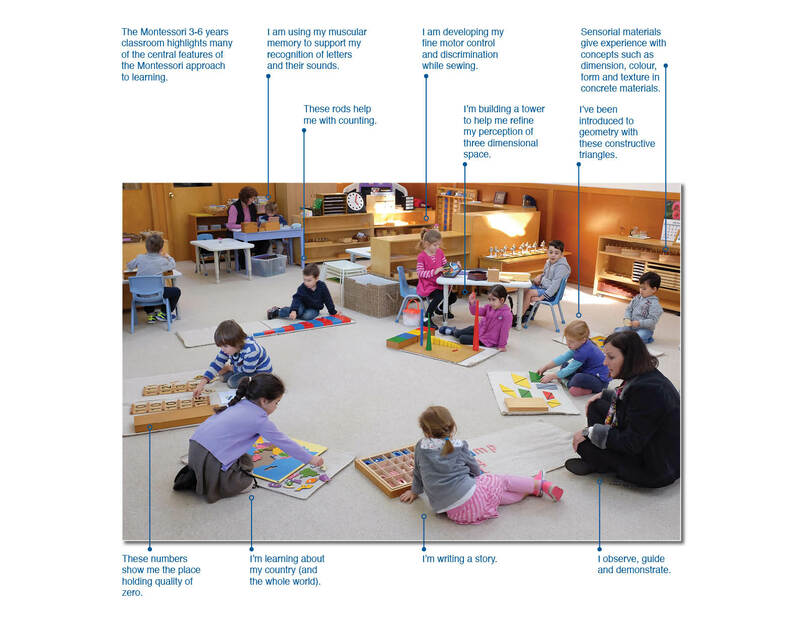 The Montessori classroom is created to enable children to learn through their own manipulation of materials. There are five main areas in the Montessori pre-school environment. The children explore all these areas at their own pace, guided by the Directress. Within each area the materials follow a specific progression. The concepts become progressively more complex, requiring more concentration and a longer attention span.